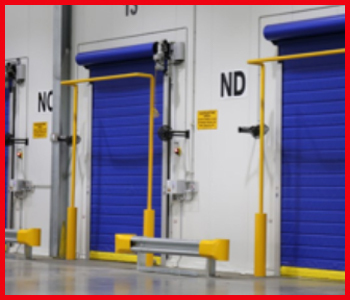 You need durable, reliable cold storage high speed doors that can open and close hundreds of times a day while conserving energy and keeping cold items in safe temperature zones. As a leading cold storage door manufacturer, ASSA ABLOY builds specially designed solutions to meet the unique needs of cold storage areas. The cold storage doors have a positive effect on your bottom line, whether you’re using a high ­speed cold storage door to create a thermal barrier on a loading dock or a mobile high­ speed door to create a tight seal on the refrigerated truck. Choose a storage high speed door to increase productivity and preserve the cold chain in high-traffic cold storage applications. Meet the demands of cold storage areas with the Albany cold storage and freezer doors. Albany cold storage freezer doors combine fast speeds and a reliable thermal barrier to protect the product quality in critical temperature zones. These innovative freezer door solutions enhance temperature control, decrease energy costs, and increase productivity. The Albany RR300 Chill cold storage insulated high-speed door is specially designed for high traffic cooler and freezer cold storage applications. The high-speed energy efficient door enhances safety, improves productivity, reduces energy costs, and decreases maintenance costs. Opening speeds of up to 120 inches per second makes the Albany RR300 Chill one of the fastest cold storage high speed doors on the market. The Albany RR300 Chill is ideal for high-traffic areas where the temperatures in the cold storage areas are above 32° F.
From freezer to the loading dock, the Albany RR300 Freeze insulated high-speed freezer door saves on energy and maintenance costs while maximizing workflow efficiency and ensuring a safer, more productive environment. Albany RR300 Freeze freezer doors feature fast opening speeds, insulated door panel material and double weather seals for superior temperature control. These industrial freezer doors can also be equipped with heated side frames and energy-saving airflow systems to prevent frost buildup. The Albany RR300 Freeze is optimal for dual-climate facilities where temperatures below -20° F open into ambient temperatures.